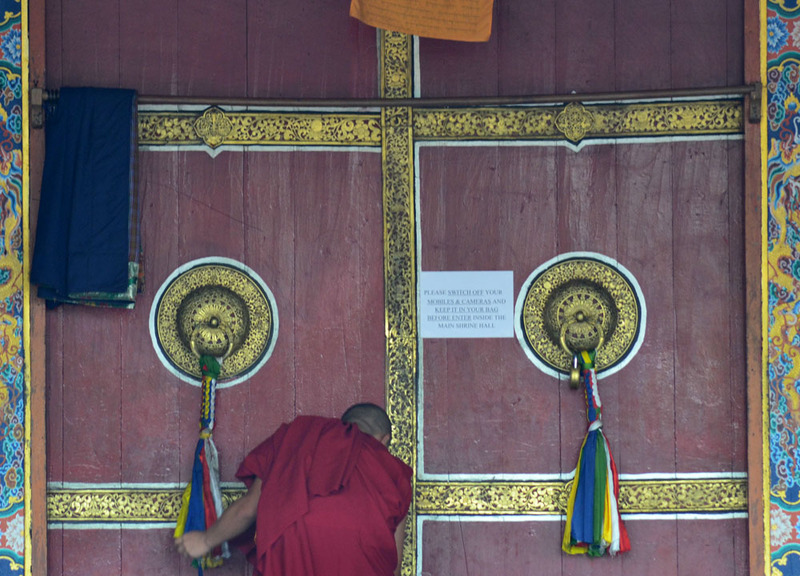 One of the most extraordinary experiences of my life was at Rumtek Monastery. While exploring alleys behind the Monastery a young Tibetan monk appears by a doorway, hands me a Milkybar Mango Choo Bar, spreads his arms to the side, makes airplane noises and vrrrumms off to the back of the Monastery. How amazing is that? Do Milkybar Mango Choo bars even exist? Before this moment I’ve never felt closer to heaven, nirvana or whatever they call it. A paradise which rains fruit flavoured chocolate bars. Where everyone can ‘Enjoy the Chewy Nestle Milkybar Mango Chew with goodness of milk in every bite’ (not sponsored). 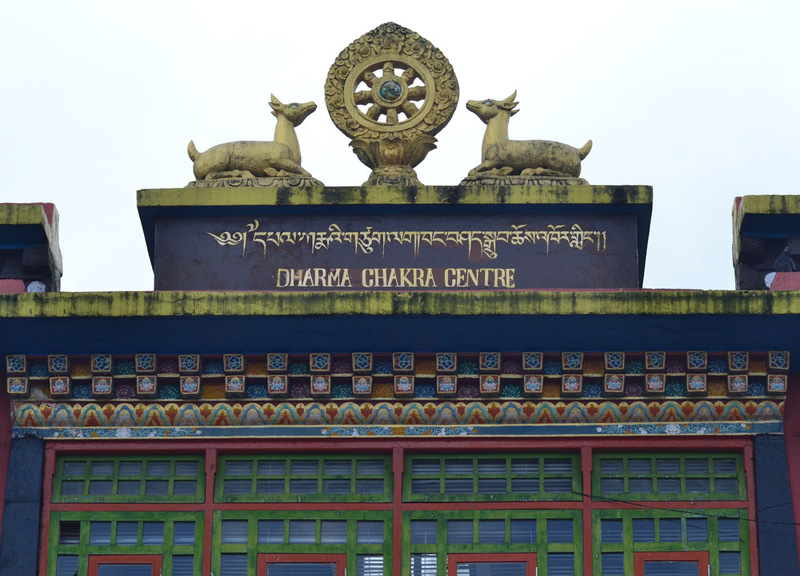 Rumtek Monastery was a very different experience to our previous at Enchey Monastery. Rumtek found in mountains while Enchey hides in a forest. Rumtek in seclusion while Enchey next to a city. What stands out the most however was the security at Rumtek Monastery. Passport check at the front gate, a 5 minute walk (up hill) reaches further security, passing through metal detectors on entrance under watch of armed guards. Security slightly over the top. The reason being is to prevent violence between opposing monks. 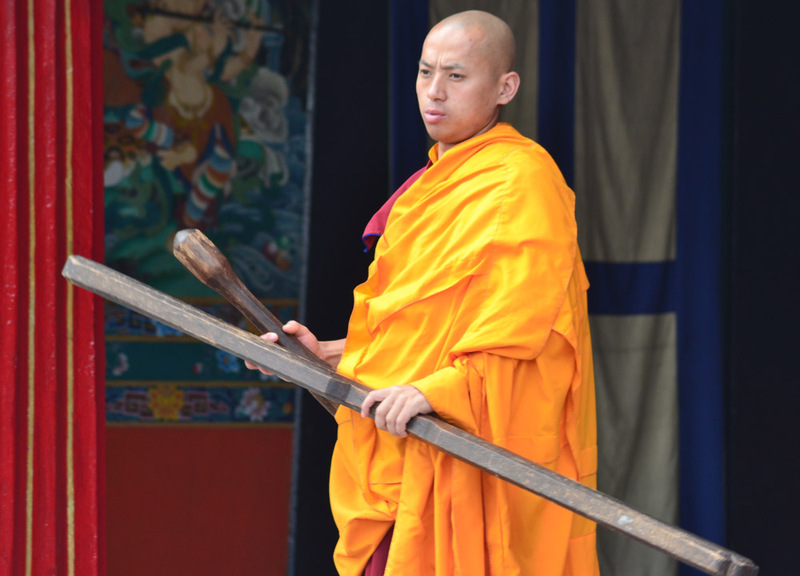 Rumtek Monastery has long been a contentious monastery where pitched battles took place between two factions of monks both claiming ownership. Armed guards now patrol to prevent further violence. Now inside are Karma Kagyu monks who await their leader who was forced into exile. The Monastery now ‘a house without a father’ and the monks appear to be bored awaiting his unlikely return (full story here). Arriving through the front entrance we find few monks in the central courtyard. High security somewhat shrouding the enchantment of the experience. As clouds fall to blanket the monastery, a monk appears from surrounding living quarters. Holding wood blocks he takes place at the central monastery building and bashes the blocks together. This I am guessing was the lunch bell. The doors to the monastery close and stragglers make their way to the back of the monastery for their feed of Dal Baht. Behind the central monastery building is the dining hall and living quarters. You can also find the housing of the Golden Stupa here, which being lunchtime we missed. Much of the Monastery is closed between eating and midday. We circle the area spinning prayer wheels and watch the monks go about their day. I’m guessing the monks don’t get out much and spend much of their days conjuring games, climbing buildings and playing pranks. Many monks we found on rooftops staring out into the distance. On leaving two of the younger monks flick pennies onto a central post in the courtyard (video below). There is a strong sense of boredom at Rumtek Monastery.